Here are reasons why many corps member believed they would be paid N50,000 at the end of August as their monthly NYSC allawee. For over three weeks, serving corps members across the country have been very excited over the purported increase in their monthly NYSC allowance from 19,800 to N50,000. In the era of social media fake news, it was pretty easy to get the corpers excited over allawee increase as fake videos show some of them celebrating the increase. Actually, the purported allawee increase will see corps members earning over N60,000 monthly if we add their state government allowance to the take-home pay. Of course, there are lots of things fresh graduates who are still serving their fatherland can do with N50,000, but see, any information about allowance increase is not worth celebrating until you receive the alert. Over time, corps members have always fallen for allowance increase rumour. In 2014, rumours spread all over NYSC camps across the country that the Goodluck Jonathan led administration was planning to increase the corps members monthly allowance to N30,000. That rumour quickly died down as neither the government nor NYSC management came out to say anything about it. Fast forward to 2018, stories about allowance increase came up again and the Federal Government gave it some sort of credibility by announcing that there is a plan to increase the allowance. On Thursday, August 2, 2018, the Director General, National Youth Service Corps (NYSC), Brig. Gen. Suleiman Kazaure while addressing corps members in Abuja said, the Federal Government is ready to increase the NYSC corps members' allowance. Kazaure said the NYSC received a letter from the Presidency through the Ministry of Youth and Sports Development that the process to review the allowance of corps members had started. The NYSC DG said, “the federal government is working to increase your monthly allowance, therefore, wherever you find yourselves conduct yourself well, be a good ambassador of your family, the scheme and the nation. Six days after Kazaure's announcement, a twitter handle, APC Newspaper, which claims to be a social media mouthpiece for the ruling party, All Progressive Congress announced that President Muhammdu Buhari has raised NYSC allowance to N49,800. Meanwhile, Kazaure and the APC Newspaper did not state a specific time the allowance would be increased, but one week after they raised the hope of the youths, rumours started flying again that the Federal Government has increased corps members take home to N50,000. Unconfirmed news reports and fake video came up showing corps member celebrating the increase. Some of them even claimed to have received an alert that confirmed the increase. Meanwhile, as corps members continue to celebrate the purported allowance, the management of the National Youth Service Corps kept silent on the matter. 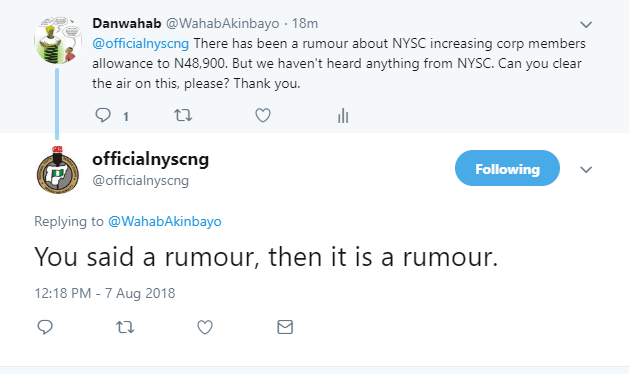 Pulse Community reporter, Bayo Wahab tweeted at the NYSC to confirm the authenticity of the rumour and the NYSC replied saying ''it is a rumour''. Fake news about allawee increase is a recurring rumour corps members fall for every year. And until the Federal Government increases the allowance, serving corps members will not stop to spread and believe rumours about it.